David Higgins and Subaru WRX STI Win the 2013 Rally America National Championship with a victory over Ken Block at Lake Superior Performance Rally. The Subaru Rally Team driving the 2013 WRX STI had a goal to beat their top rival and they did it again. Subaru has won the 2013 Rally America Championship by beating Ken Block to take top spot. And this is the third year in a row the Subaru Rally Team of David Higgins and Craig Drew have stood on the podium. The spectacular victory took place this weekend at the Lake Superior Performance Rally (LSPR). This was the final round of the 2013 Rally America Championship and Higgins entered LSPR locked in an epic season-long battle with rival Ken Block and his Ford Fiesta ST. Block needed the win at LSPR to steal the championship away from Higgins, who had led in points nearly all season. Both drivers gave all-out driving performances but Higgins edged ahead of Block near the mid-point of the rally. The Subaru Team driving the 2013 WRX STI never looked back. Block sustained heavy damage on his Ford Fiesta after rolling his car and had to retire from the race. The Subaru WRX STI went on to win the LSPR and more importantly the Championship. And this is Higgins third Rally America Driver’s Title in a row. The Lake Superior Performance Rally event featured slick wet roads as well as some drying roads with better grip on the final day. Higgins and Drew had the best tool for the job; their Vermont SportsCar prepared 2013 Subaru WRX STI rally car with Subaru’s excellent Symmetrical all-wheel-drive. The battle began with Higgins and Block trading stage wins early in the event. Block slipped ahead of Higgins by just 8.6 seconds after Day One’s daylight stages. The Subaru WRX STI handled the night stages well which were treacherously slick and foggy. With two big stage wins in the dark, Higgins closed the day with a 13.6 second lead. “It was dark, it was slippery and it was foggy, just like back home (in Wales, UK)! So I knew that was our time to really attack,” explained Higgins. Block drove all-out and gained back several seconds but couldn’t keep from crashing on the day’s third stage. With Block sitting on the sidelines, Higgins and Drew treated the final stages as a victory lap. Higgins went on to win the rally by over three minutes. The podium at LSPR was an all-Subaru affair with Antoine L’Estage and Dillon Van Way finishing 2nd and 3rd overall, each at the wheel of a 2013 Subaru WRX STI. Higgins’ victory also earned Subaru the coveted Rally America Manufacturer’s Championship. Congratulations to Vermont SportsCar, Subaru of America and the Subaru Rally team for an awesome year. 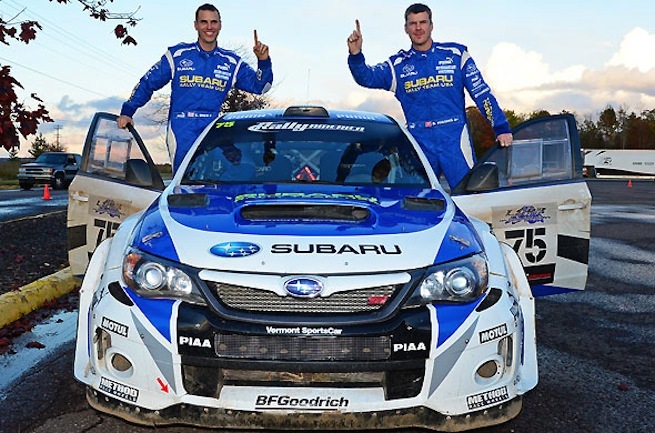 Watch Flat out with the Champions: LSPR Onboard with Subaru Rally Team USA video. I was glad to see that Ken Block and Alex Gelsomino at least made it a race to the championship in the final event. It would be great for the Rally America guys get some kind of television coverage next year with the rising success of GRC and rally type racing - even if only on some small channel (as opposed to GRC playing on ESPN). Yes, would like to see some TV coverage, but it would be hard to cover because of the nature of the course. GRC is ideal because of the short track and hot action.